It's been a while since I talked about training and everyday activities. I also have some race-reports waiting to be written. A lot has happened and it feels like summer really flew past us faster than any previous version. My racing season is over for this year, and preparations for season 2016 have already begun. This summer was twofold in many ways. There were many ups but they seemed to be followed most often by immediate downs. We also lost a great soul this summer. I will go through the training and racing more closely in upcoming posts, but the following graph pretty much describes my summer. Strava fitness graph from April to August. Lots of ups and downs. I had a couple of good races in Spring, both Lattomeriajot and Keravan Kevätpolkaisu went better than I expected. The training also progressed on well. First pause in training was in May. I took a week off because we moved to a new address. That really took all the energy out of me. I got back to training and I started feeling stronger again in a few weeks. Then I took a second week off training and headed to Germany with the Finnish junior team. You can read the whole story here. It was a great week, a hectic but great week. I learned a lot about cycling during that trip. It took me a couple of weeks to get back in shape, but the break had given me more watts. I felt maybe stronger than ever. Then just after midsummer I got ill and that squeezed all the positive energy and watts out of me. Almost 2 weeks off the saddle with a small temperature really damaged what I had gained during spring and early summer. It took me a long time to get back, and I felt I actually never got back into shape after that. 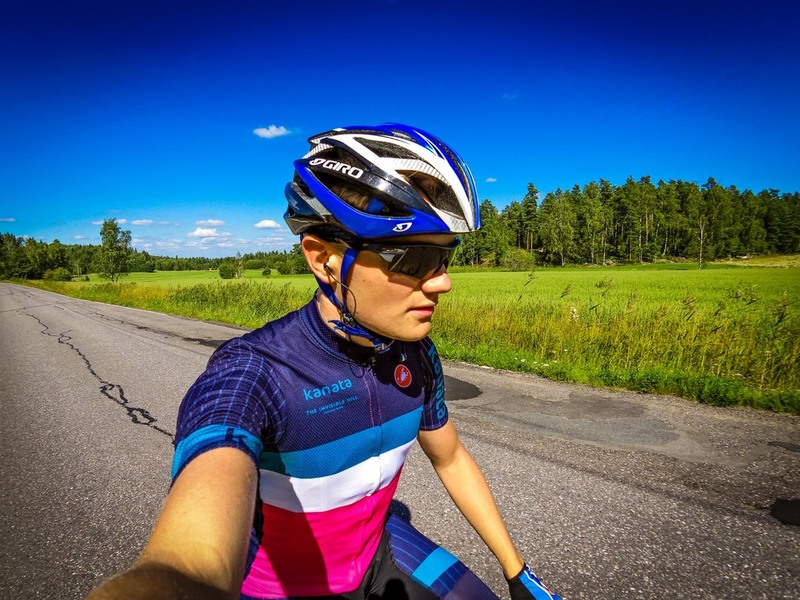 We rode the Saariston Rengastie in July, and those kilometers were probably really precious for me. Had a blast with Jamie and Pavle doing the Archipelago Trail. 190 km in rain and shine. I did a pretty good ride in Vuelta Vantaa (after missing the start...), Eteläkärjen Ajot and Myllyn Pyöräily. But the strong feeling just never came back. I also struggled with some knee-issues during August. Really digg our new team-kit. Then, after Myllyn Pyöräily in mid-August, having knee-pains, I just lost the feeling and motivation to ride. I should have had a race the third Sunday in August, but that was cancelled by the organizer. I allowed myself to set the bike aside and concentrate on my new job. Kanata Racing Team after finishing Myllyn Pyöräily. All smiles! Now I am back to training. I have allowed myself to ride easy and short this week, and will start looking into season 2016 in the near future. Now I won't bore you with more stories, instead I'll try to overload the servers and add some pictures from the past months and weeks. Expect more stories and race reports in the upcoming weeks.